When Brian Levy set himself out to design a tiny house he wanted to create something that was comfortable long-term, sustainable for the environment yet still stylish, and he didn’t want to compromise anywhere. He believed the Minim Home should feel amazing throughout. He’s also the founder of Micro Showcase, a place dedicated to showcasing micro buildings. When you take the tour of his 210 sq. ft. modern tiny house below I think you’ll agree that he accomplished all of those goals with this 11′ wide by 22′ long footprint home. Sure it’s a wide load, but Brian’s logic is sound. Most little houses spend most of their time being lived in, not moved. So it makes sense to go wider. And yes, the home is still built right onto a trailer so your home can be towed and moved when and if you ever wanted or needed to move it. When you go inside you’ll find all of the comforts of home. A kitchen, multi-functioning table, stools, sofa with room for five people, giant projector screen for entertainment, roll out bed (instead of a loft), 5’x7′ office area, 5′ closet, bathroom, and bookcase that holds 150+ books. The total cost for materials to build this tiny home as you see it was $30,966. If you enjoyed this 210 sq. ft. tiny home you’ll absolutely LOVE our free daily tiny house newsletter with even more! Thank you! One of the nicest tiny houses I’ve seen! And funny timing since I was noodling around in my head the other day a way to do some kind of slide-out bed (I don’t like lofts either — old enough to have middle of the night potty trips which are just a pain with a loft) so this was a great solution!! In fact, it there were a shed roof instead of gable — with the high side obviously on the bed/office side — there would be great head room for that raised office area. Anyway, very cool design and beautifully outfitted! This is excellent example of feeling large in a small space. Like the concept very much. Looks very livable. When I look at all these plans, at my age (75) there are two things that seem to be missing. 1. Sleeping at the main level, and 2. comfortable seating. This has 1 but not two. Otherwise, good plan with new ideas. I like what they did with this place. But I agree. But then, some people don’t mind seating like that. I’ve seen far too many plans for boxed seating with thing or barely minimum cushions. I’d prefer to have a small love seat big enough that I can curl up in to read a book. Very nice. The Marine/Yacht high/low table with multiple floor mounting holes is killer. To add at least 2 ottomans, a comfortable recliner, more cushion thickness to increase comfort of an otherwise not very comfortable if well laid out. 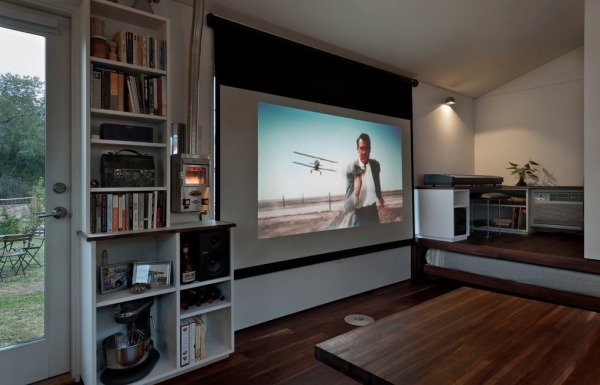 Increasing over 10′ wide really helps as you can have things 2′ deep on every wall and still have good center room even with recliners, etc sticking out. 8′ wide is very limiting. Still don’t see the attraction of a peaked roof in such a small home. I like mine flat enough to use it as a patio up in the breeze away from the mosquito’s. Especially with solar as a shade roof above it for shade and a breeze. ah… but with the peaked roof, solar panels get sunlight all day… first in the morning and then after noon the other panels get the gain. 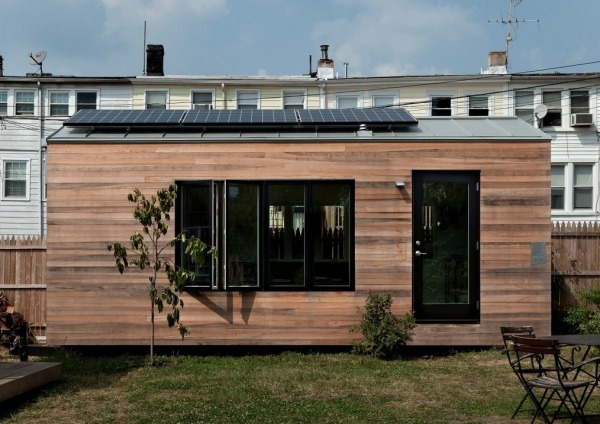 So long as tiny home sited correctly will maximise the amount of electricity storage. Why are you putting the panels on the roof? You might not be able to angle your TH as needed making my version better at that. I’ve been researching SIPs and considering a wider footprint. I’m so exited to see a TH with these things I know it can be done!! Now I just have to figure out how to incorporate homes for my 6 + birds. Where is the shower. Don’t see the closet. It is a very perfect design. I bow before you and your genius, Brian Levy. At $30,966.00, this house is a STEAL!!! It would take us two years of saving to buy it outright but I can easily see having one of these amazing tiny homes on our acreage for our adult kids to live in when they stay with us. Flawless in every single way. I’ve NEVER seen such a grand-sweeping window treatment in the kitchen; I could stand by the sink and gaze outside for hours. The 11′ depth is perfect; I have lived in 8′ wide rooms before and my skin crawls at that shallow depth. I adore the Scandinavian Modern interior: the perfect blending between white/wood/metal. Regarding the roof: if I had Brian build one of these for me, I’d have him put in a skillion roof instead of that ‘Baby Peaked’ design. I grasp what he was doing regarding sticking the solar panels on there but with a well-positioned Southern exposure to a skillion roof, it would be no problem. Plus, our lot is so heavily wooded, IF we went ‘solar’ on this unit, we’d most likely need to have the panels free standing and located in the rare sunny spot on our property. This is one of the best designed spaces. Brian did a very thoughtful job. I noticed the flat panel Econo heaters that appeared in the earlier video don’t seem visible in the pictures above. Did Brian remove them & if so why? nice TH for one person but the lack of sepperat sleeping area makes it unworkable for a couple considering the work area is ontop of the bed but like the one lady said it could be a good guest house. I like the light and open feel and magazine quality finish. 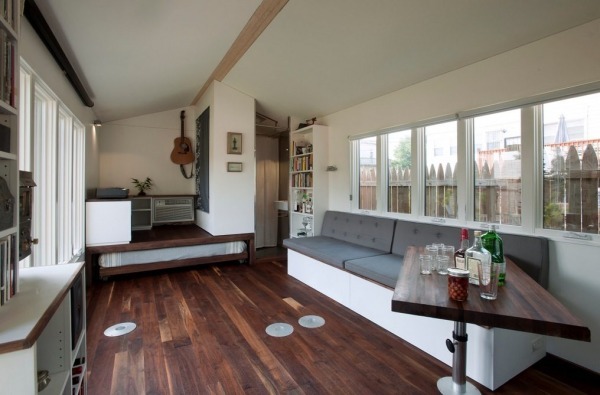 This is probably the smartest and most clever tiny house I have seen yet. A little pull out here, a repositioning there, and you have multipurpose features, and different ways of handling your indoor environment for what you want to do. Close it off, watch a movie, go to sleep, cozy up with a book, let in the light and entertain guests. Add to that, it is beautiful on the inside with attention to detail. Also, it is nice to see the use of what appears to be an Incinolet, which I have yet to see in another tiny house, as we are used to seeing composting toilets. I like the idea of incinerating one’s waste rather than having to find a place to dump it. I admit I am spoiled and much prefer a standard flush toilet, but this a great second option. 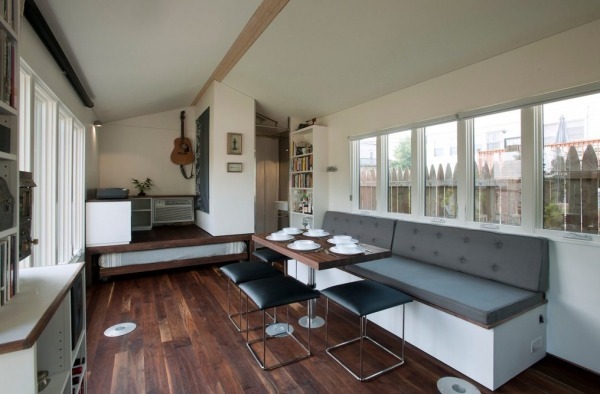 One of the issues I have with tiny houses that are on wheels instead of a foundation is that you are pretty much limited to the 8’6″ width which can feel cramped after a while. Also, due to the weight, they are really not designed to be *traveled* in, unless we are talking about some of the smaller versions such as the Miter Box. So, to me, it doesn’t make much sense to build a tiny house on wheels that you will only move occasionally and expensively. Since this achieves the same thing, even though you would have to have it professionally moved, at least you can benefit from the added width and smartly putting the working ‘guts’ into the seating area of the house and have them easily accessible as opposed to a closet attached to the tongue of a normal trailer. You then have them right there and don’t have to go outside if something goes wrong and others can’t break into them either. Having lived in two different apartments consecutively for several years that were both around 200 sq. ft, I know how to work space and this guy – he nailed it. This little house is cozy, doesn’t feel cramped, and invites one to come in and stay. From what I understand (which isn’t much) is that a lot of people build tiny homes on trailers to circumvent building codes, not to have a true “mobile” home. Therefore limiting the max width to DOT standards, which is around 8’6”. There are other reason to build a THOW as well. No property tax was a big one for me. No building codes is huge as you mentioned as well. Mine is 12’x28′ build on a standard 8’6″ trailer. I agree with Brian that it makes sense to go a big bigger, as most people don’t move these very often. A wide load permit is not that expensive, and then you just need one pilot car. Mine feels more like a small cottage at 326 sq. ft.
can I reach out via email to speak about your project please? I am curious to where I could find the adjustable table set up. I’ve look on RV and marine sites, but I can’t seem to find one with adjustable height. Thanks anybody. Finally! a proper kitchen. I like this design a lot. Beautiful home! I especially love all the windows and the multi-functioning furniture. Light, bright and happy place. One of the best I have seen! What a lovely home and what a gracious owner. If you get a chance, watch the video tour. Loved the layout, even the pullout bed. He thought through what he needed and did it at a very affordable price, I think. Each builder has to do that – think out what they need and can live with – but so many great ideas are combined in this design. I love light, so the big windows are a plus for me. Also bath and kitchen at opposite ends is another plus for me. The clean lines allow my eyes and mind to rest. Thanks to the builder/owner for sharing and thank you, Alex, for including it in this ‘tinyhousetalk’ edition. Great alternative to a Retirement Home&I could divide my time between each of my Children’s back yards, instead of being stuck w/just 1 location! It is a very attractive arrangement and gives the feeling of spaciousness. I don’t care for a wet bath, but if you can take what is now Storage 3 and add it to Bathroom 4, you might be able to get a dedicated shower in the space. I love all the windows which brings in the light that makes it look more spacious. This is the best tiny home I’ve seen. I could live in this tiny space without changing a thing… errrrr… well… is there space for my La-Z-Boy? Nice sized home, well put together home. It could use a bit of color but otherwise, quite nice!! This is my favorite one that you’ve featured. The clean lines, wood floor, pull out bed, hidden full keyboard, room to hang guitars, What else could you want? The north wall has too much window to keep in warmth, and keep out the view of apts. But maybe you need that option if you ever plan on resituating. NICE! Love this TH. Did see it on Tiny House Nation. On THN they mention the total build was $30k and $15k on materials… Did I hear wrong? Now with it being 11′ wide what are the towing restrictions? They had one very similar at the Md Home &Garden show in TTimonium this weekend. Trying to find out more about compost type toilet they had. Didn’t have name on it. Lots of interesting ideas to use in a tiny home at tbe show. Even had an elevator. Portable solar generator and these hanging loungers that could probably be a bed. I just saw a weird article from two of the guys who used to belong to this group. Turns out there were some issues. How accurate is this. Do you know anything about this? Wow, Brian should hang his head in shame. Unfortunately, it’s intentionally inaccurate. See the FAQ of the microshowcase.com website. Really like this TH a lot. The versatility of the bed/couch pull out and moveable table coupled with the sense of space and a near full kitchen makes this design my favorite I’ve seen. Thanks for showing. If http://boneyardstudios.org/2015/03/20/what-happened-with-boneyard-studios/ article is correct then Mr Levy’s humanity is in serious doubt. Thanks for drawing this to my attention Vanyel. Thanks for the work you do Alex…very much appreciated. Beautiful, light, and spacious. The only downside for me is the wet bath – I’d have to figure a way to get a tiny dedicated shower stall in there. But otherwise, it’s great. Really love the sleek, clean design. The only thing I’d want to do is entirely enclose the mattress by a full length cover, using same wood as the flooring, and attaching a couple of drawer pulls to keep mattress better protected from floor dust/mites etc. Excellent design! Genious plan! … maybe the best I ‘ve seen so far. This is – by far – my favourite tiny house. I love love love it. I particularly like the desk/coffee table/dining table/side table. I think it is amazing, and love the ability to change the height. I am tried to work out if the owner has done this – but can’t see if he has. It it was my house, when the table is positioned as a side table at the end of the bench/couch/lounge – I would have the option of it being as high as a kitchen bench – which would add 30% to the size of my kitchen (when required). I’ve seen Brian’s house in person a few times, and it’s just as nice as the pictures, if not more so. Excellent layout and even better build quality. I love the modern elegance of the high quality furnishings and aesthetics and the efficient and clean design and layout. Very well done and meets the criteria of simple living without sacrificing comfort and quality. I would buy this and could live in this easily. Great plan. Love that it is wider. The long narrow places are not for me. And, as I see more, neither is the THOW. But I still get tons of ideas from all of the places I’ve viewed. Now, as far as the squabbling about boneyard homes is concerned, I’ll just get off the bus and let the rest of the riders figure it out. I have seen this one several times now and I remain very impressed. It is my all-time favorite TH. Of course I would change a couple of small things and add some colour because I’m me and have different needs and likes to Brian. But I love this design; the space, light and originality really appeal. Love how modern and modular this is! Can’t go quite this modern inside our Airstream (especially the clean lines) but picked up a few ideas to make our tiny home more clean looking. Thanks! Little late on the thread, but love this tiny home! I would make a few changes though. I think instead of having the work/office space with the bed rolling under it, I would just put a mattress where the work space is and have it there permanently. I realize that I would lose space that way, but seems more efficient to me. Also, instead of the couch design they have, I would like a little love seat and maybe a recliner. I would lose some storage, but seems like it would be more comfortable that way. I understand the concept of the wet bath, but I wouldn’t like that at all. Questions to note– where’s the fridge? Did I miss it? And with it being so wide would you have to have a vehicle to tow it? This continues to be my all time favorite TH. Nicely done. Looks like a 4 burner stove would have fit. Beautiful, essential, functional, excellent choice of materials and colors, well layout windows, but mostly it does not flaunt wealth glimmer artful, it so the skill and inventor/performer capacity stand. Thanks again Deek for bringing us another great interview and showing of a great tiny house…! I love it ..! It definitely serves it purpose buy providing this gentleman and his dog a wonderful place to live and create his music.. Also I love the inventive bath and kitchen.. He most certainly shopped wisely and with purpose, to which you can see he made good use of in order to create this wonderful place ti live….! Best of luck to him, and mans friend…! I have always loved this tiny house and signed up to be notified when models were available. When notice came, I asked for photos of the new Minim and I’ve watched the website regularly but they’ve never posted updated photos. I sre that others on this blog have also requested photos with no luck. The Minimis a beautiful and thoughtfully designed THOW but the failure to even post photos of a completed unit for over a year makes me wonder what is going on with this company. Thanks, Natalie. Those photos are of the original house. The one they are now selling is larger by a few feet and has some different options. According to the blueprint, they’ve reconfigured the bathroom and also now offer the option of putting the bed on the platform. There is also an option for a washer-dryer combo on the platform. I just can’t understand why, if they have had completed units with the new options for over a year, they can’t update the photos on the website. They are supposedly trying to sell Minims but can’t or won’t offer updated photos. It’s a bit like Ford offering new models but posting photos of last year’s offerings. 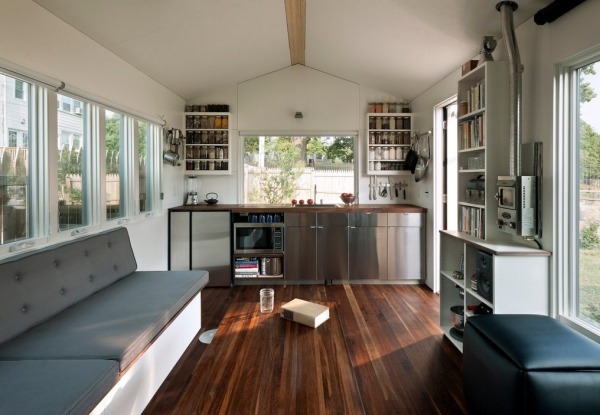 This is one of the nicest tiny homes I have seen. It avoids having a loft which I think is really nice and the kitchen/living room feels really open and large. Yea I love the space — it’s great! Very nice layout , and the natural light coming in through all the big windows is a big plus in my book…! Natural light is always an important feature! Did you hear that noise? It was my jaw hitting the floor. This is beyond stunning, breathtaking. Well done. Haha he did do a fantastic job! I like the outside, the inside is well done and looks a lot larger than it does from outside. The downstairs bedroom and the kitchen against the far wall is also a plus. The one thing that would keep me out is the toilet. It’s just a big no no. Replace that and it’s a 10! Love the downstairs bedroom! And most builders will allow you to replace the toilet, which is awesome! Can you share the recess cooktop manufacturer’s name?. Wow! The interior looks so spacious, but the outside screams tin can (small). Wow! That’s a really great one! I love that there is no loft!! Looks like an incinerating toilet? Great if it is. I would have wanted a bigger bathroom, with a steam shower that one could sit in and for the bathroom to have at least a small window in it. But this is really cool, the finishes are amazing!